I need to listen to it again sometime to confirm, but this is my favourite of Guy's albums. The first three singles were absolutely brilliant and the rest of the tracks are all of high quality, so much so that fourth single "Get Along" is one of the weakest on the album. Wow! I really enjoyed this. 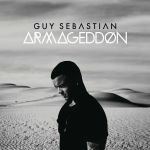 I'm a casual fan of Guy Sebastian at the best of times, and I only really loved Battle Scars from here of the singles, but the album tracks really make up for the lacklustre singles. Great songwriting and awesome vocals. He's very talented, and I'm impressed quite a lot more than I thought I would be. Nice work! 4.5/6.